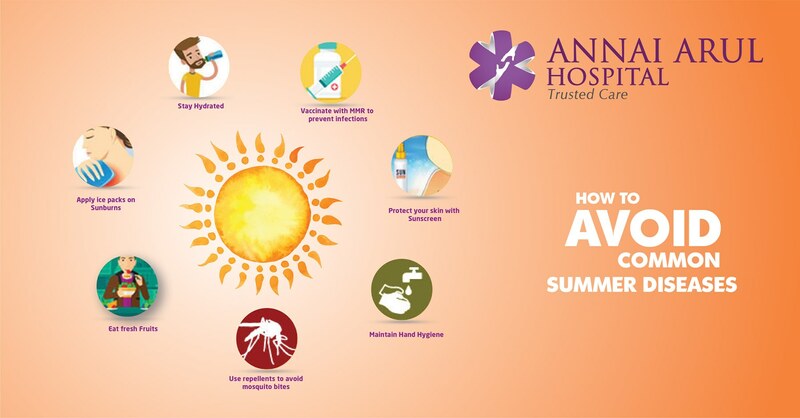 HOW TO AVOID COMMON SUMMER DISEASES? The period from March to June is the summer season and it is the warmest of all seasons in a year. Summer brings with it a dry, warm and hot weather in India, when schools and educational institutions take a break from the harsh weather. It is also that period of the year when lot of health issues crop up for children as well as adults. The scorching heat and the driest of dry weather brings with it a host of diseases if proper precaution is not taken. Heat Stroke: The rise in body temperature due to prolonged exposure to the summer heat can lead to heat stroke. It is an abnormal rise in body temperature or hyperthermia along with physical and behavioural symptoms like headaches, nausea, dizziness, muscle cramps, faster heart rates and fever. Food Poisoning: During the season a surge in harmful bacteria and parasites occur causing food-borne disease. The warm and humid weather provide the right environment for bacterial growth leading to food contamination. Sore Eyes: Conjunctivitis is a disease that is also known as sore eyes which is typical of the summer months. The presence of viral or bacterial infection and allergies lead to the inflammation of the conjunctiva and causes much irritability, redness and pain in the eyes. These are contagious and can affect anyone who comes in contact with an infected person and it lasts for 4-7 days at a time. Headache: Due to dehydration and heat the summer season causes typical headache problems to many people. Mumps: This is a contagious and threatening viral disease that tends to spread during summer. It can be transmitted when an infected person sneezes or coughs. It affects the parotid gland in front of the ears, causing severe swelling, pain and fever. Measles & Chicken pox: Viral infection causes measles and chicken pox especially in young children during summer. The symptoms include skin rashes, high fever, cough and watery eyes. Sun Burn: The overexposure or going out without proper skin protection can cause exposure to harmful ultra-violet radiation from the sun that leads to painful skin rashes known as sun burn. Water-Borne Diseases: Summer is a season for water contamination that causes widespread diseases like diarrhoea, dysentery, cholera and typhoid. Mosquito Infections: The mosquitoes are active and breed during summer giving rise to mosquito bites that spread and cause a great deal of infections in humans. How to prevent Summer diseases? The rise in body temperature will lead to dehydration, so replace the water in the body by drinking more fluids and keep the body cooler. Increase the intake of fresh juices and plain water and avoid beverages, alcohol and sugar. You can also eat small, light and frequent meals instead of larger ones. Include fresh fruits and vegetables with more water content in them like peaches, melons, pumpkin, cucumber and onions as they are also easily digestible. Drink coconut water, lemon juice and fresh fruit juices to fight the summer weather. Maintain general hygiene, prevent mosquito bites and get proper vaccination against diseases like measles, mumps and rubella. Protect your skin with sunscreen and use loose fitting and lighter clothes all the time as well as protect your eyes with coolers when you go out. Take bath twice daily and wash your hands, face and eyes with fresh water when you return home.